Sea World—An Expensive Evolutionary Tourist Trap! While in Australia, our family members decided to go to Sea World. They thought the family (including our grandkids) would have a great time as they watched the various shows and took in some of the attractions, but they weren’t ready for the intense evolutionary indoctrination in Sea World’s new dinosaur exhibit. 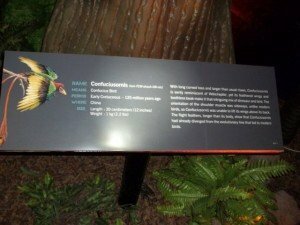 It seems this new multi-million dollar exhibition has one purpose—to convince children and mums and dads that Darwinian evolution is fact and that birds are actually dinosaurs (because dinosaurs supposedly grew feathers and became birds). Our son-in-law wrote this report after taking his kids to Sea World on the famous Gold Coast of Australia. Sadly, Australia, like most of the western world, has given up many Christian aspects that once permeated the worldview of the culture. They’ve traded them for secular humanism—which now pervades the culture. For secularists, to justify their views of moral relativism, they use evolution and millions of years in their attempts to explain life without God. As we saw at Sea World, most parents had no idea what they were doing to their children by taking them to this new “temple” of evolutionary secular humanism and letting them be indoctrinated in this anti-God religion. According to the true history book of the universe—the Bible—birds were made on Day 5, and dinosaurs (which are land animals) were made on Day 6. So birds existed before dinosaurs. But evolutionists claim dinosaurs existed before birds! This brings me to Sea World on the Gold Coast in Australia. You would think Sea World would focus on creatures that lived in or near the sea (like dolphins, polar bears, sea lions, sharks, star fish, and so on). And they have some of these at the park, of course. However, they have a new addition to Sea World—a Dinosaur Island that is split into two portions. 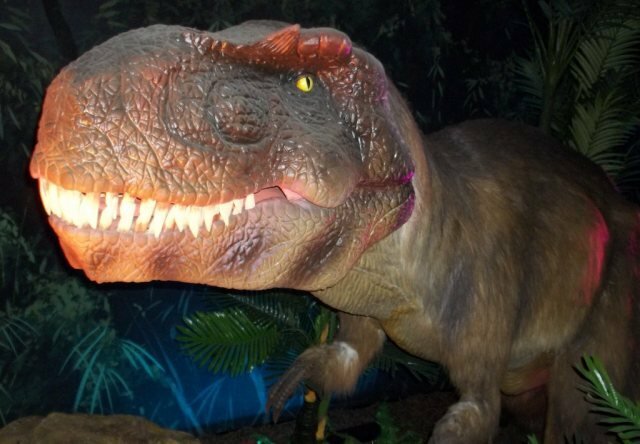 It’s a two-story addition devoted to convincing people of the secular humanistic view of the evolution of dinosaurs into birds, while is blatantly hitting people over the head with “millions of years”. 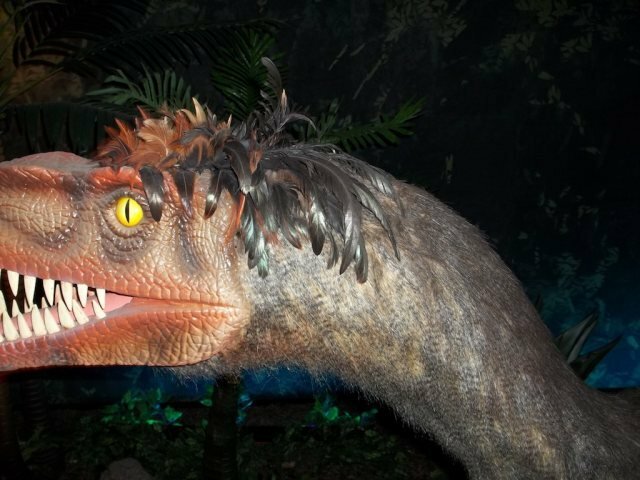 They cover T. rex with feathers, where no T. rex fossil has ever been found with feathers. 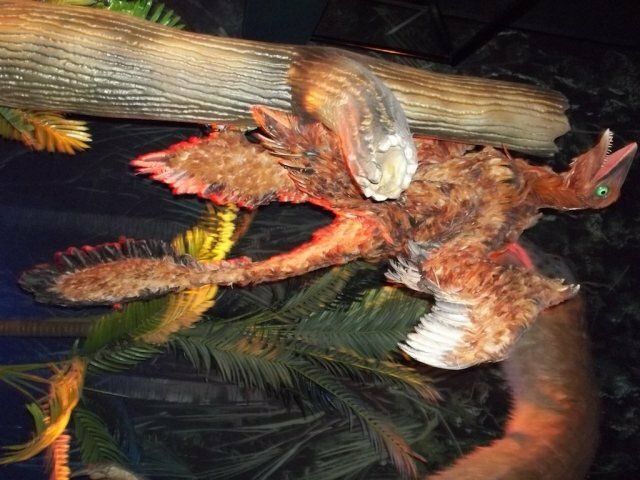 Then the exhibit covers a Velociraptor with feathers, but researchers have never found a fossil one with feathers. Most dinosaurs at Sea World’s indoor facility have feathers attached to them. 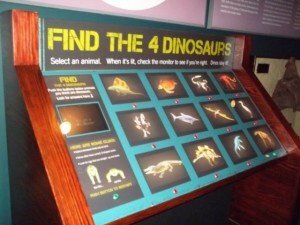 They even have a game that seems to target young children, where they are told to pick the 4 dinosaurs. 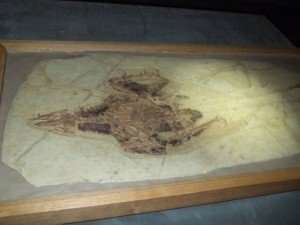 They are then forced to pick both dinosaurs and birds, including fossil and modern birds. So they are blatantly trying to indoctrinate the kids (and adults) with the religion of evolutionary humanism and millions of years. Those who play their game have no option but to call a modern bird a dinosaur! They also talk about “protofeathers” in the exhibit. So, what is a “protofeather?” Well it’s something that is not a feather but evolutionists want it to be a feather! But it’s all in the terminology that is used to indoctrinate the public. What are they are really doing? Here is an analogy—consider this hypothetical example. 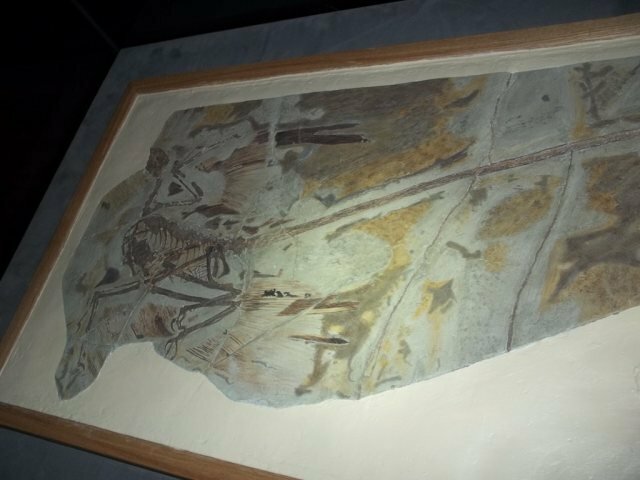 If someone came up to you and said, “Look—the ancient extinct Meganeura monyi or Giant Dragonfly evolved into birds” and then said, “Here are the feathers to prove it,” and they showed you a fossilized seagull. Would you believe it? Biblical creationists would say that the fossil layers from which they are digging up these fossilized birds were laid down during the Flood (about 4,300 years ago) and that they were buried the same year as the dinosaurs (now dinosaur fossils) that the evolutionists claim they have supposedly evolved from. The millions of years is a farce in light of a global Flood. There are three ways the evolutionists try to make missing links (intermediates). We need to understand these and teach them to this generation so that our young people will not be easily indoctrinated by this false religion. Consider these three in the light of this Sea World exhibit. Dino-bird Missing Link method 1: Take birds and make them look like dinosaurs. Dino-bird Missing Link method 2: Take dinosaurs and make them look like birds. Dino-bird Missing Link method 3: Take bones of both birds and dinosaurs and try to make a fictional link (or merely imagination like artist depictions, like the faked Archaeoraptor). In the case of this Sea World exhibit, its designers used both of the first two methods. They took fossilized birds and tried to use them to convince people of their “dinosaur” nature (they are in a dinosaur exhibit, after all). They took dinosaurs and made them look like birds by adding feathers to them (e.g., the T. rex and Velociraptor models made with feathers). Friends, we need to keep our mental buzzers alert about the latest attacks on biblical authority. They are all around us. Sadly, even at theme parks like Sea World, children will be indoctrinated in an anti-God religion. 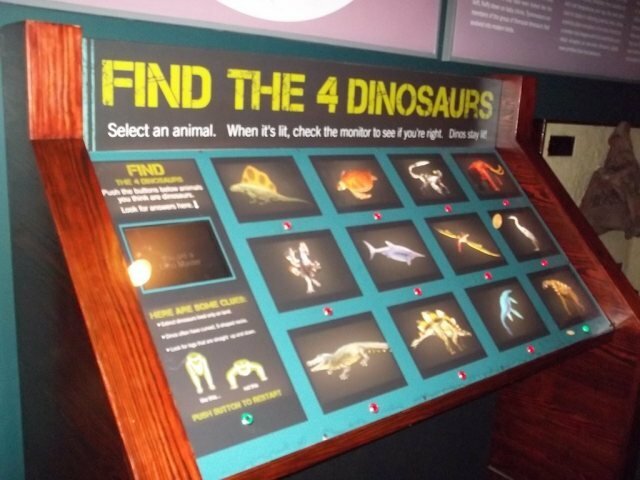 I encourage you to bring your children to the Creation Museum in northern Kentucky to learn the truth. It’s also much, much cheaper (and every ticket is a two-day ticket). For more information, go to www.CreationMuseum.org.